Welcome to Golden Gate Financial! Golden Gate Financial is a full service mortgage provider that has over 29 years experience in the Mortgage Industy. We are dedicated to fulfilling your mortgage needs and providing you low rates at a low cost. Golden Gate Financial has earned a reputation as one of the top Wholesale Brokers in the State of California. We are located in the Bay Area: Petaluma, Santa Rosa and Sacramento are only a small list of some of the areas that we service, but we can provide mortgages to all residents of California. FHA mortgage loans are issued by federally qualified lenders and insured by the U.S. Federal Housing Authority, a division of the U.S. Department of Housing and Urban Development. VA mortgage loans are issued by federally qualified lenders and are guaranteed by the U.S. Veterans Administration. Providing Jumbo Loans in Santa Rosa, Petaluma and Sacramento Areas as well all of California. Jumbo Loans exceed the maximum loan amounts established by Fannie Mae and Freddie Mac conventional loan limits. Being a Wholesale Mortgage Broker allows us to utilize our vast number of approved Wholesale Lenders to obtain the lowest competitive interest rate and the mortgage program that specifically is tailored to your mortgage needs. Many of our competitors in the Retail Mortgage Area are limited on what programs they can offer and the interest rate and costs they are mandated to charge their clients. With our experience and affiliated Lenders we have the ability to offer practically every mortgage program available in the market today and we have become industry experts in knowing which program will best meet your mortgage needs. 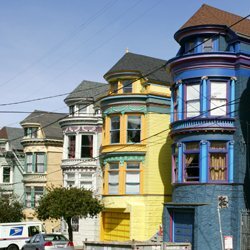 We are centrally located in the Bay Area and offer unparalleled mortgage and refinance service to clients throughout the entire State of California!